You would be hard pressed to find a better Grand Final than the 2017 CBH Group Colts Carnival decider between the South West and Peel. A set shot after the siren was a fitting way to decide the competition and the 2018 version is building up to be much of the same. 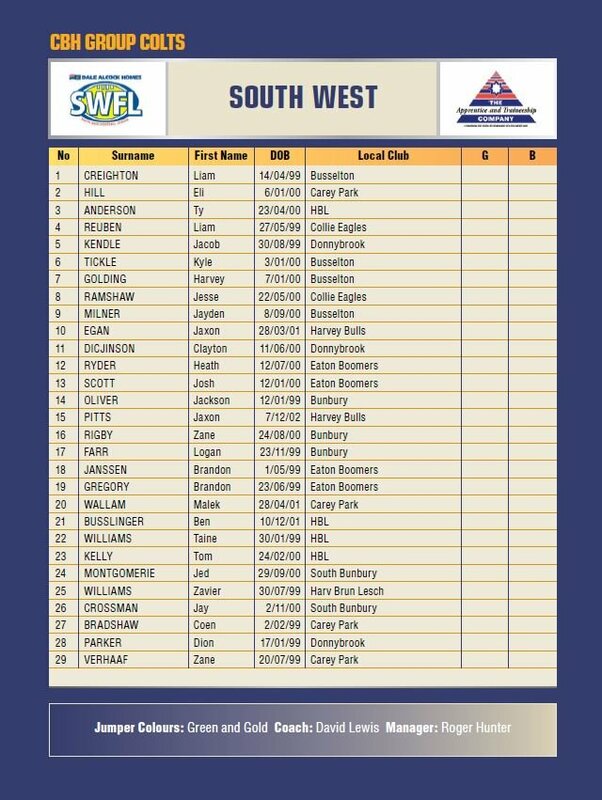 South West have been powerhouses of the competition since its inception in 2000 claiming 14 of 18 titles along the way and will be looking to make it a hattrick of titles in 2018. The competition though has never been as close as it has been in the last four years with narrow victories in 2016 and 2017 following on the back of break through wins for the Northern Suns (2015) and Peel (2014). In 2018 the South West will again be led by David Lewis who has been at the helm for the past two seasons. 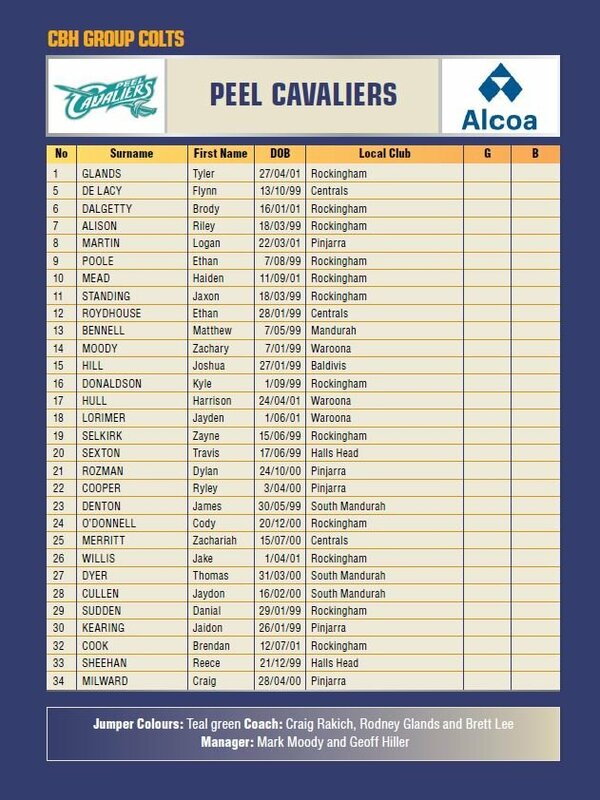 A strong squad has again been assembled with the majority having League experience in the strong South West competition. 2017 CBH Group Allstar Taine Williams, small forward Eli Hill and exciting half forward Jaxon Egan are among a host of names sure to catch the eye over the carnival. After a heart-breaking loss in last years Grand Final Peel return bigger and better looking to claim what will be only their third Colts Championship if they are successful. Fresh off a successful 2018 Great Souther Colts Carnival, where they defeated Lower South West in the final, the Cavilers will be confident that they have the stocks to go one step further. Zac Moody and Matthew Bennell have both been in outstanding form to date this season and will be key players for the local side. Regional Districts found there mojo late in last years carnival to finish in third place and will hoping to hit the ground running from the first bounce this year. 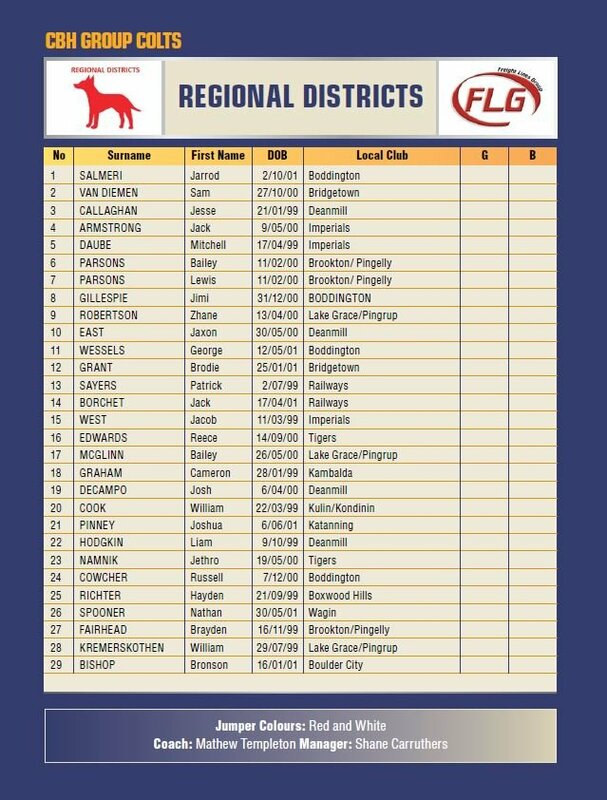 A spread of players from the Ongerup, Goldfields, Lower South West, Upper Great Southern and Eastern Districts Leagues make up this years side. 2017 Allstars Jaxon East and Jethro Namnik join a strong side that includes CBH Group Country Colts representatives Sam Van Diemen, Jarrod Salmeri, Jimi Gillespie, Russell Cowcher, Jack Borchet and Nathan Spooner. 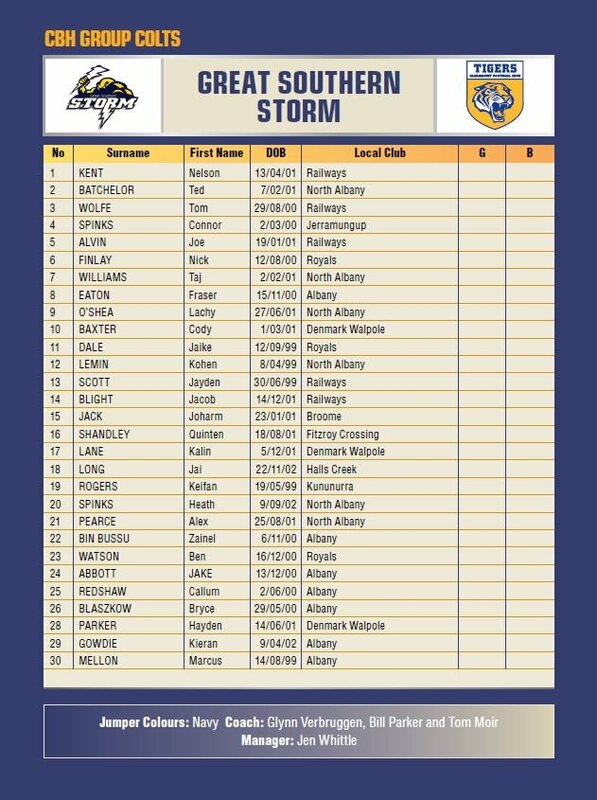 The Great Southern Storm will have a new face at the helm with long standing coach Phil Gilbert moving on over the off-season and has been replaced by a new face in Glynn Verbruggen. The Storm came close to success in 2016, narrowly going down in the final and Verbruggen will be eager to see how his charges fair against quality opposition. A number of players have had Country Colts experience this year which will hold them in good stead whilst the inclusion of four players from leagues in the Kimberley is sure to add some X factor to their lineup. 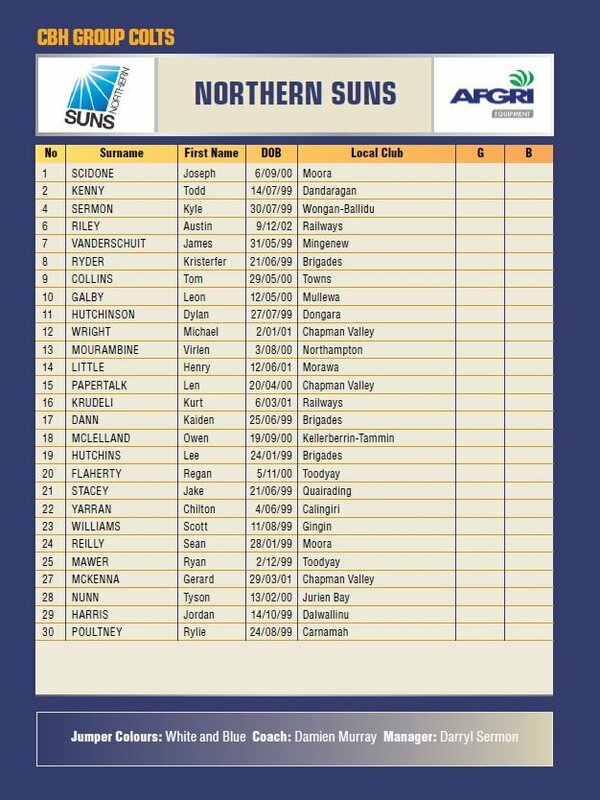 Following their success in the 2015 carnival the Northern Suns haven’t been able to recapture that form in the carnivals since. 2018 may see that change with an experienced side coming together on the back of the Northern Regions Colts Carnival. The side comprises of players from Mortlock, Great Northern, Avon, Central Midlands Coastal and North Midlands. Calingiris’ Chilton Yarran, Chapman Valley’s Len Papertalk and James Vanderschuit from Mingenew are all excitement machines that will be looking to showcase their talents across the carnival. Each year the colts carnival provides a platform for the next generation of Country stars to put their name up in lights and 2018 is looming as one of the most exciting carnivals in recent memory.